Photograph of Trinity students with children at Harvest Festival. 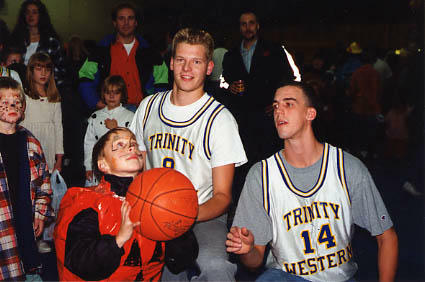 A note in black ink on the back of the photograph reads "Brett Nelson, the 6 yr. old pumpkin, received basketball advice from TWU students Dean McClelland, #8, and Andrew Willms, #14. They were playing for candy at TWU's Harvest Festival on Oct. 31st / 94."